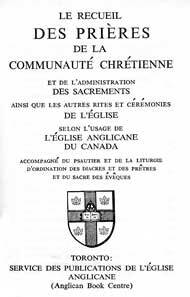 This translation into French of the 1962 Canadian Book of Common Prayer was made in 1967, and is the official translation. It appears in David Griffiths' Bibliography of the Book of Common Prayer as 36:77. Griffiths states that the translation was made by Yves Dubois & John Kirkby. As Griffiths notes, and as can be readily seen, there were several lapses in the production of this volume, the most notable of which was the transposition of the two headings in the Table of Kindred and Affinity (resulting in the prohibition that a man may not marry his father, etc.). These have been corrected where found and as my extremely limited knowledge of French allows. If you find errors, please do let me know. The Book appears to contain everything in the English version, with only a few minor exceptions: Biblical texts for the epistles and gospels are given by reference only, and the Table of Moveable Fests and some historical matter (39 Articles, etc.) are omitted. Besides the HTML pages liknked to below, we also have the entire book available as PDF graphics. The PDF file does have extractable text, but that text has not been proofread and undoubtedly contaqins errors.